The sound you hear in the video below is coming from the high voltage arc, there is no other speaker being used to generate the sound. In the summer of 2014, a co-worker and I were planning on attending the Electrostatic Society of America (ESA) conference at the University of Notre Dame. I decided to work on a project to take with me, a plasma speaker. Most speakers work by using a cone to push air to make sound. A far less efficient way of doing that (but way cooler) is to generate a high voltage arc which also pushes air to make sound. To generate the high voltage, I used a flyback transformer that I pulled out of an old CRT television. 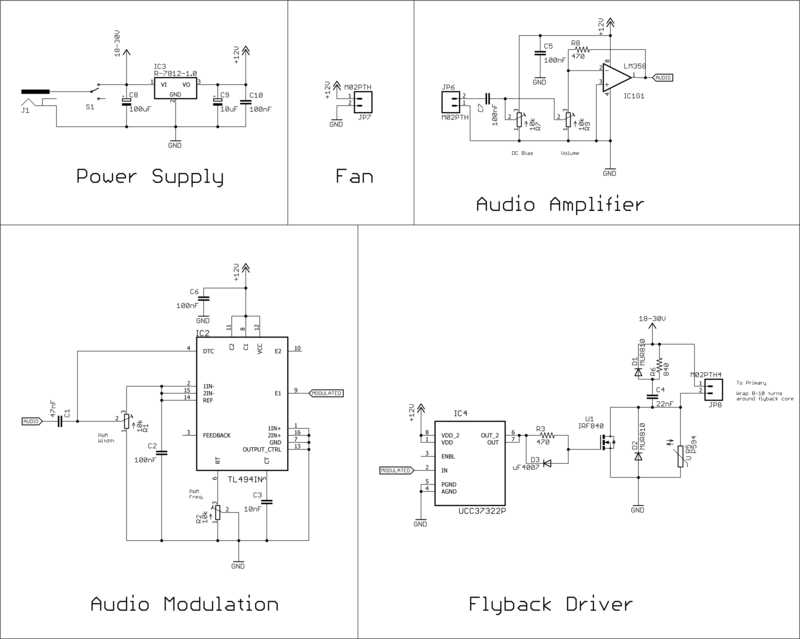 Here’s a picture of the board I made, along with the schematic. I’m going to explain how the circuit works, but instead of starting from the input and working to the output, this time it might be easier to start at the end. As I said, I used a flyback transformer to generate the high voltage. Instead of using the primary built into the transformer, I wrapped about 10 turns of 20 AWG wire around the ferrite core of the transformer, this gives me an easy way to adjust the output voltage by adding or removing turns on the primary. Flybacks can be a bit nasty though to drive though. The reason they have their name is because some of that high voltage flies back to the primary, which can damage or destroy components connected to the primary. By adding in D1, D2, C4, R5 (MOV), I’m able to suppress the high voltage spikes and keep my MOSFET (IRF840) within a safe drain to source voltage. IC4 is just a MOSFET driver to help switch the FET more efficiently and allowed me to run the speaker longer without overheating. Every transformer is going to have a frequency range where they operate most efficiently. Linear power supplies are often extremely heavy due to the size of the transformer inside. Those transformers switch at the mains frequencies of 50/60 Hz. If you made the transformer smaller, it would become less efficient at those frequencies and would have to transfer less power from the primary to secondary. In order to get more power out of a smaller transformer, you have to increase the switching frequency to match the transformer. This is why switch mode power supplies are so small and light, because they switch at frequencies a few orders of magnitude higher than what comes out of your wall, so they can use much smaller transformers. Humans can hear anywhere from about 20 Hz all the up to 20 kHz (lower as we get older), but a flyback transformer is most efficient around 100 kHz. What this means is that I wouldn’t be pass my audio signal directly through the flyback. Instead what I needed to do was use a carrier signal at 100 kHz and modulate the carrier based on the sound from my audio source. And because the carrier is well above human hearing, you won’t need to worry about demodulation to listen to the music. I modulated the audio signal by using the TL949 PWM IC. 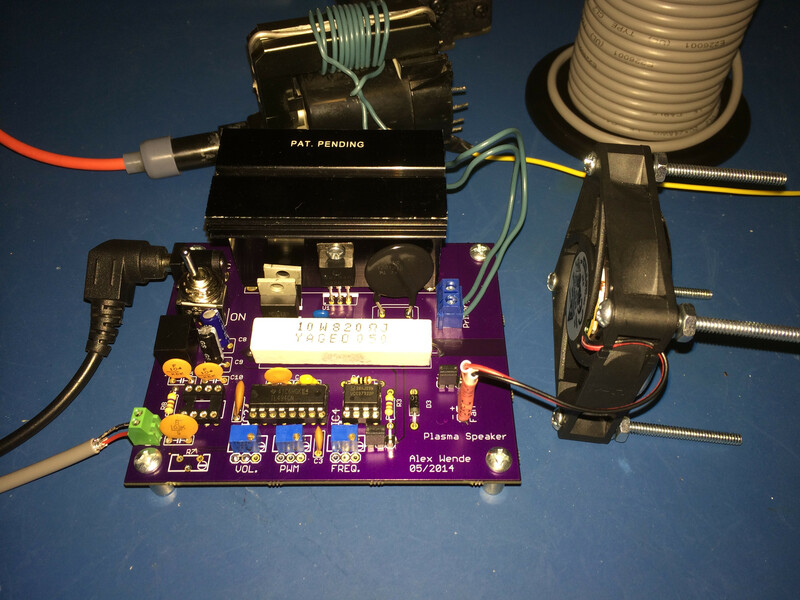 It works similar to a 555 timer, but it’s much easier to adjust the duty cycle from 0-100%, all you need to do is wire in a resistor and capacitor to set the frequency. By wiring in the audio signal between the input and DTC pin, you’re able to modulate the pulse width based on the audio. Finally, I used a LM358 to amplify the audio signal, but I had difficulty setting up the offset for the audio source to amplify without severely clipping, which is why in the picture above, I removed IC1 altogether and shorted pins 2 and 3 of the volume trimmer together.